Mother's Day will be upon us soon. Since my mother has already completed her earthly journey, I thought it was time to look at the new mothers in my world. 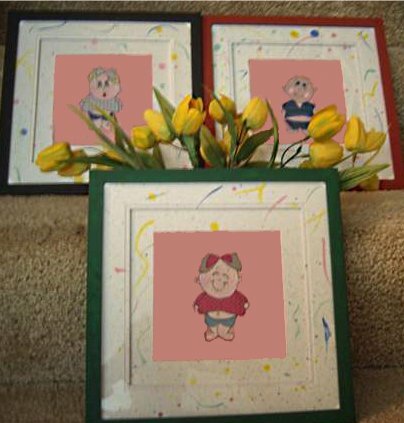 These are going to be great for a new mother to decorate a nursery. When I went to school, (before computers - but not before paper LOL) we hand-made a lot of crafts for our moms and dads. 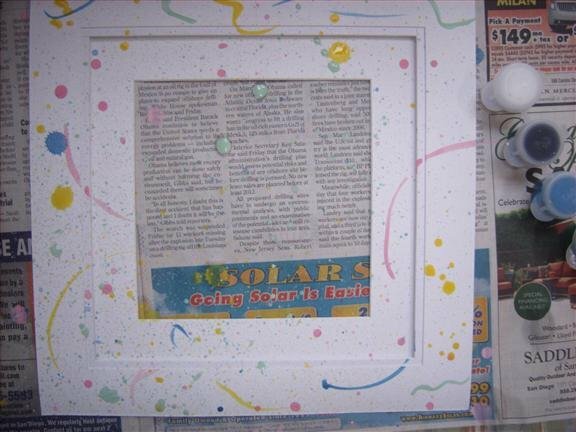 One of my favorite methods which I believe is still in use today, is the spatter painting technique. 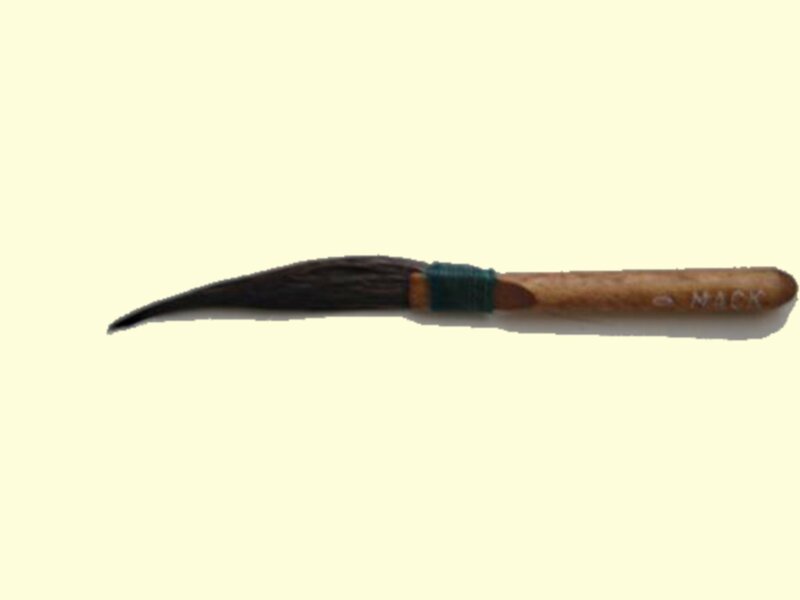 That is where you put paint on a stiff brush and then drag a dull knife across the bristles to create a light, medium or large dot on your paper. The tools I am using are still simple. The only piece that is a little more advanced is my ‘mop' brush. This brush is a size 0, costs between $20 and $50, some synthetics can be found for even less. I found it once in a marked down bin and thought it was cool. When I purchased it I had no idea what it was for. . .
A mop brush is round, made of soft, absorbent natural squirrel hair. 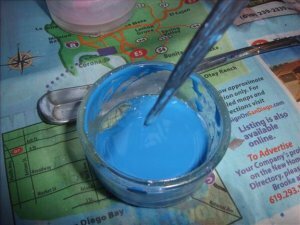 It is used mainly for watercolor or writing/printing. 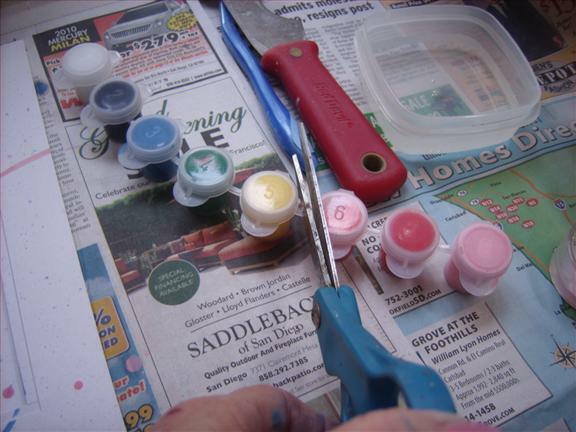 When used in watercolor, it would be used not only to lay down the paint, but if there were too much water in one spot, it would be dried gently and placed on the liquid to absorb excess paint or water. It is known for its absorbent character while allowing for a very sharp point. When you are done using any expensive brush, be sure to clean using the proper solvent. With a limp brush such as this one, it is advisable to dip in milk and gently reshape its soft hair. I used it for making swirls and larger dots because it is very limp. 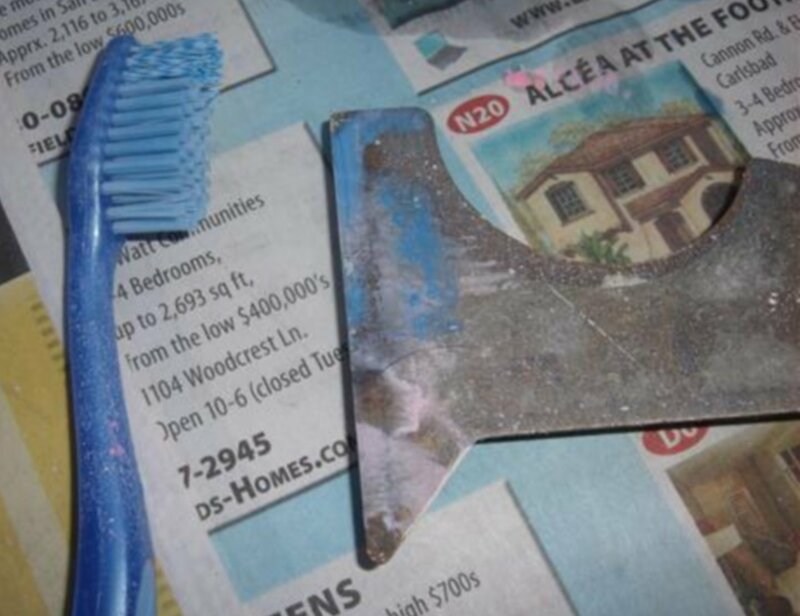 I began by using my highly technical tools - a tooth brush and a paint scraper. My paint bucket is a votive candle holder. I used acrylic paints and watered them down for my purpose. I just wanted a light spray, and the thicker paint would result in a denser spatter. I forgot to cut the lid link on the paint pot and made a mess trying to use the blue, it was all over the place. Cut the top link with scissors but leave the bottom together for ease of use and storage. Duh! I was having so much fun. That is a problem when I ‘paint' (I use the term very loosely) because once I start, I want to keep on going, and going, and going. But I stopped and I do like the result. It is like a party without the noise. 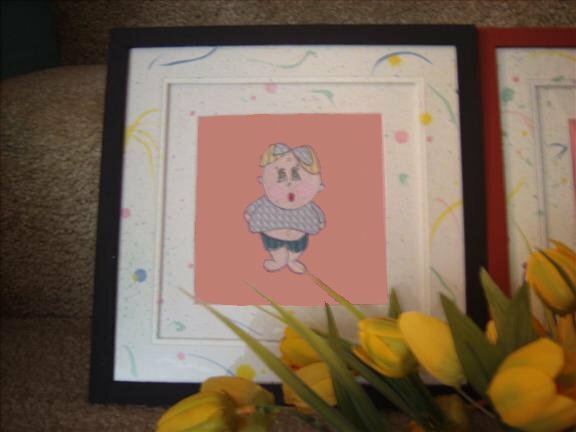 I had three designs for a baby and embroidered them in a jiffy. The ones I used were from the Download Designs section where I Searched on "Baby's Nursery." These three were by a single designer that I liked. They have a really great stitch pattern on the large sections. Here is the resulting gift. I can hardly wait to see the look on the new mother's face when she sees a touch of whimsy for her new nursery. Well, I like my projects anyway. I will make more of these and sell them. Speaking of selling, don't forget that I sell my Spreadsheet, How much to charge for your embroidery projects. You will really like that helpful, easy method of making that choice. Don't work for free and don't be overcharging your clients. Great idea...too cute! Gonna try to do one this week for Mother's Day! Most of us likely did this one as children. It helps to be reminded because we do forget about a simple method like this one. Kids can do it too, but be sure to have lots of old clothes and newspaper around, it can be messy! Watch out for Ann the gran description of their products and non-return policy. I recently ordered the habdprinted handbag KIT and what was sent was 4 complete handbags I feel that this item was misrepresented. To all sewers, a kit means a pattern with fabric -not ready-made. I told my teen family members that when they got out of school, we would make these purses together. I wanted to return this item and they refused. I want to be taken off of their mailing list. I will also tell my quilting and sewing groups as well. I am disappointed at their lack of professionalism and we will not be supporting them. any more, Buyer beware! Two More Really Terrific Free Software Programs LaRueSews-Quilts-Did You Needle Turn Today?